Accessory Dwelling Units: At nearly every housing forum, residents report that accessory dwelling units, which include stand-alone little cottages, converted garages, granny flats or miscellaneous structures turned into smaller homes, are an acceptable and desired form of housing in our city. In contrast, hulky blocks of apartments are less-desired. Accessory units fit into our existing community character, which has more single-family homes than any other type. According to SANDAG, we have 13,000 detached single-family homes, 8,000 single-family multi-unit homes (i.e. duplexes) and 4,000 multi-family homes (condos and apartments). Estimates indicate that there are at least 1,000 unpermitted accessory units here, a large portion built before we incorporated as a city in 1986. Besides being a part of our community’s fabric, accessory units provide needed housing at lower prices, and additional monthly income for homeowners. As a city, we have certified 610 accessory units over the last 30 years, permitting 27 in 2015 and 24 in 2016. Recent loosening of state laws has already resulted in increases to the number of accessory units locally, which is a great thing. We currently have 41 accessory units under construction and 22 seeking permits. Unfortunately, we don’t know the number of accessory units permitted by the county before Encinitas became a city. It’s important to distinguish between housing for long-term residents who are renting, and housing for folks vacationing in Encinitas. City regulations don’t require a business license or paying any taxes or fees for long-term rentals of accessory dwelling units. But if someone is offering short-term vacation rentals where they rent for under 30 days, then they’re required to register and pay a 10% tax to the city. 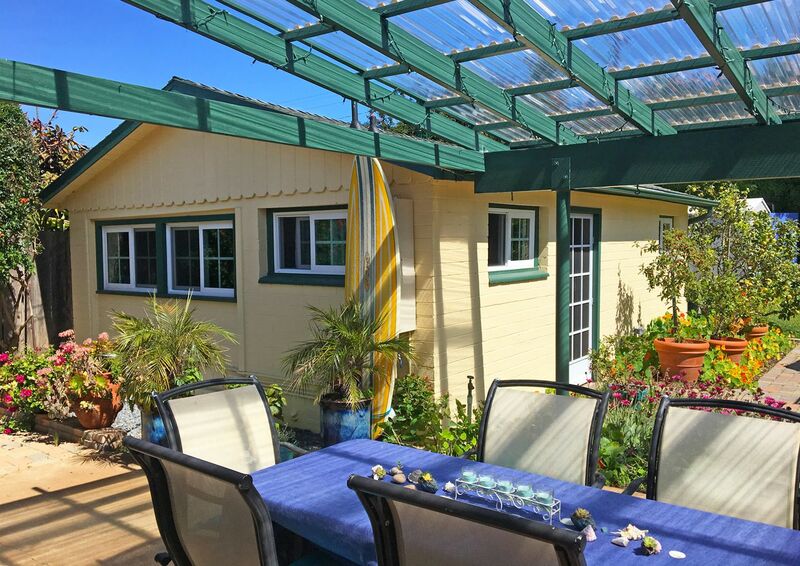 Here’s a local Encinitas guest cottage, one type of accessory unit. We’d like to make it easier for folks to obtain permits for their accessory units. Over time, this would allow us to count more accessory units toward our state-required housing needs, which will reduce the need for upzoning properties. Permitting accessory units will also ensure a higher level of safety for our city’s residents, and it gives peace of mind to land owners striving to follow the rules. So we’re moving forward on two parallel fronts. At the state level, we’ve proposed a bill that would allow a local inspector to certify an accessory unit for basic health and safety, but not require the owner to comply with all current building codes, which can be prohibitively expensive or literally impossible. Many of these units remain unpermitted because the owner’s only option is to completely rebuild the unit or tear it down. Obstacles can include drywall that’s too thin; a ceiling that’s too low; or insulation, windows, lateral resistance, and seismic requirements that don’t meet current code requirements. Our lobbyist spoke with more than a dozen legislators and as many housing advocates in Sacramento and beyond about this proposed bill, and received a lot of positive feedback. I’m grateful that our local state senator, Sen. Pat Bates, is willing to carry the bill. She is consistently responsive to our city’s needs and I appreciate that from our state senator. The specific language of the bill is currently being drafted by the attorneys who work for the legislature. The second front is on the local level – we’ve had three “amnesty” type programs related to accessory units, but none of them have been very successful. Some of the reluctance to participate has stemmed from requirements that owners deed-restrict their unit to be affordable, which means they likely collect rent that is lower than market rates. We’ve also discovered that some of the impediments come from our local regulations. For example, there are restrictions on the total amount of lot coverage allowed on a buildable lot that can make an accessory unit impossible to permit; sometimes the setback requirements in certain zones mean an existing unit would have to be torn down because it’s sitting inside the prohibited area; and there are limits on the maximum living area for an accessory unit, rendering some structures too big to ever be permitted. City staff is going to return to us with proposals on relaxing some of these requirements in certain circumstances. Loosening local zoning standards is a trade-off, but we first need to know more about what the stakes are. The City Council will review staff’s proposals and proceed from there. Here’s an Encinitas Advocate story about the accessory unit proposal. Can we achieve state certification if we cap the upzoning at two stories and 30 feet, which is consistent with our existing Prop. A requirements? What is the minimum number of units we can upzone to achieve state certification? This impacts what’s known as the “buffer,” or the number of upzoned units beyond our state requirement. A buffer is needed because sometimes a site develops under its previous lower-density potential, causing it to drop out of the upzoned inventory. How can our plan increase the total number of actual affordable units that are created? We want to maximize, not minimize, incentivizing builders to provide affordable units. What is the best way to count and expand the number of accessory units to maximize our state-approved credit? Can we can count bedrooms instead of counting complete housing units? For the most part at both the state and local level, government is not building housing. The city zones; the private market builds. Therefore, everything related to our housing plan relates to our zoning. We currently have about 25,000 homes in Encinitas, and the upzoning required by state law will change the zoning to allow for about 1100 more housing units to be built at some time in the future by the private market. This required upzoning in Encinitas is aimed at providing housing for people in the “low and very low” income category, which means a family of four earning $68,000 a year or less, and a family of four earning $42,000 a year or less, respectively. Where can these residents at this income level afford to live? We need to provide the zoning for the private market to build the housing for this income level, and much of this zoning is what’s called “high-density,” or 30-units per acre. In some cities that are land-rich, the city will donate land and a non-profit entity will build affordable housing for seniors, homeless, veterans, or the disabled. But in Encinitas, we don’t own a lot of land. The vast majority of our city-owned property is currently dedicated to public gathering spaces, such as parks, open space, the community center, the emerging art center at the Pacific View property, or our property is being actively used for city administration space, like City Hall. The state requires cities to upzone because California doesn’t have enough homes for all its people. Currently this “housing crisis” is generating a substantial amount of activity – forums, workshops, state bills introduced, lawsuits, tightening regulations. The housing crisis creates ever-longer commute times as people live farther from their work; increased homelessness when folks lose the housing they had and can’t find alternatives; rising land values, a good thing for owners but resulting in increased displacement and instability for renters; and concerns about sustaining the job market if workers can’t find a place to live and move elsewhere. But based on our recent progress on multiple fronts, I’m hopeful that concrete improvements will emerge from the new energy and out-of-the-box thinking we’re devoting to local housing issues.